Charged with the neorealism style of filmmaking, portraying a cultural shift in Rome post war, this film doesn’t coddle it’s audience but instead showcases a realistic and raw portrayal of the economy and the moral ideals and complications of the era. This film delves into the psyche of a society who’s been forced into change. 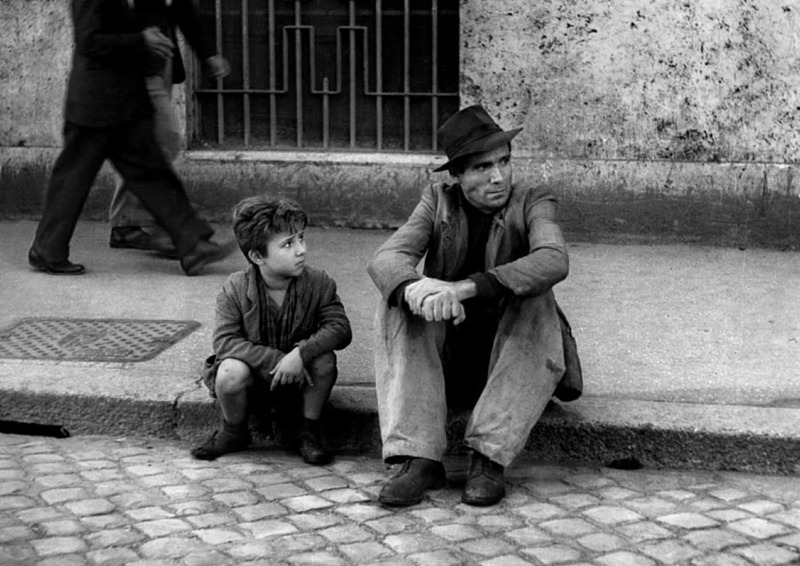 The premise of Bicycle Thieves, directed by Vittorio De Sica, is almost too simplistic for the inevitable string of events. The plot centers on Antonio Ricci, played beautifully by the non-actor Lamberto Maggiorani, a poor father living in post-war Rome and trying to build to a life for his family. One day he’s given an opportunity to work and he’s thrilled, believing his luck is changing. However, during his first day of work his bike is stolen, setting off a search of the city for his bike. Poverty stricken, this bike is his livelihood and without it he has no hope, no means to work and build the life he wishes to. Two of the greatest elements of this film are its comedic abilities and emotional impact. Classic films usually enforce a systematic style of comedy. An actor reads his line; the next actor reacts to the line. However in this film the humor was casual and more natural. Whether it the offhand way a lines delivered, such as when Bruno went to relieve himself against a wall and Antonio admonishes him, saying they don’t have the time. Or whether it be in the chase scene in the church, where a bit of slapstick is used when most of the chase party makes sure to still stop and kneel before the alter, despite the immediacy of the crime. Its emotional resonance is what steals the film. Whether it be the scene in the restaurant with a browbeaten Bruno and Antonio trying to make the day up to him, or the very last scene as the father and son duo walk into the credits. These are sad scenes. They are surprisingly emotionally impactful and they don’t use overtly, manipulative tactics to garner the reaction. The audience wants the pair to succeed and to see them mourn the loss of hope is harrowing, because in cinema we always hope to see a hyper-stylized version of life, so to instead see a life that may mirror reality is daunting, and for a dated film impressively ahead of its time. 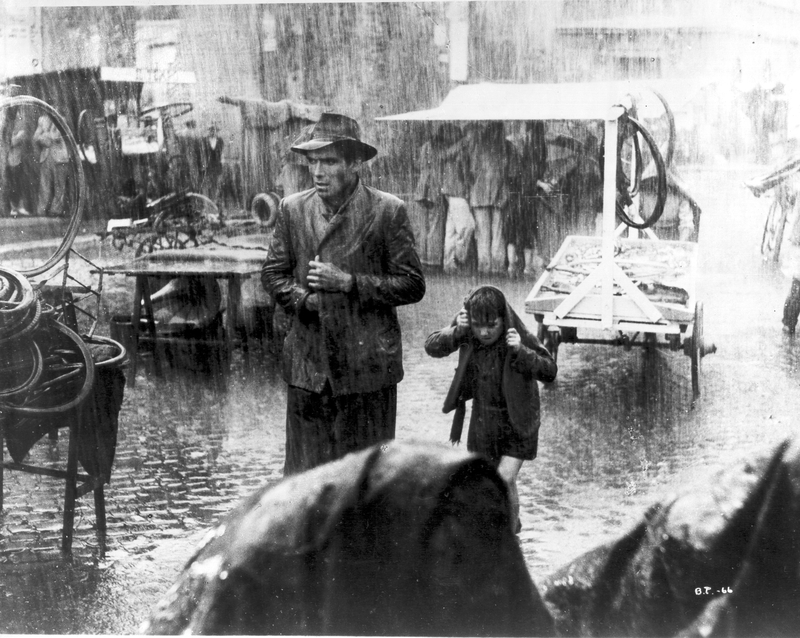 From Bicycle Thieves to Pay It Forward filmmakers have often used a simple trick in manipulating a greater emotional reaction; they use children. Children are innocent, naïve to the bitterness and corruptness of the world; they make harsh realities all the harsher. Would this film have been as sad if Bruno hadn’t been forced to tag along throughout the entirety of the search? If Antonio hadn’t had someone he had felt the necessity to impress? The familial connection and the dissonance between the man fully grown, already used to the curve balls life throws, and the young, cherub looking child who only plays at adult and is in the beginning stages of disillusion is what makes this film so powerful. This film has obvious stakes and consequences. What happens to a man who has so little, is given a taste of what could be, and has it then promptly ripped away from him? What is a man willing to do to obtain even a semblance of happiness and stability? How do we, as an audience, judge a character that’s been unwillingly put into a desperate and dire situation? Is he a good man who’s made some mistakes, or is a bad man for sinking to the level of other around him? Antonio is a man who has been fighting for the chance to make a decent living and maybe has made some poor decisions along the way. The film is about those of whom who must fight for life. Judgment would be counterproductive since the basis of this film is what real life was like during the late forties in Italy, where every man and woman was doing what Antonio was. The film is about what you do in order to survive, and the imminent loss of innocence. The film touches upon the woes of man, the trials and tribulations that an individual must overcome in life. However, to allow that as a simple summary would be a disservice for that would be romanticizing the film. They key quality of this movie is its frank delivery of the realities of life. The magic is that it doesn’t romanticize the characters – Antonio is flawed and reckless- and there is no easy out, no convenient happy ending. Bad things happen to good people and sometimes there is no escaping it. Society has rules to abide by depending on social standing. Real life is difficult and oftentimes unfair, but people learn to cope because they have no other option. 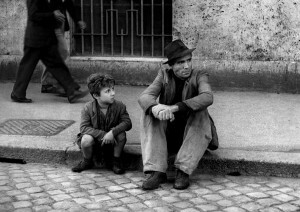 In Bicycle Thieves Antonio desperately fought against the level of society he had been put in, tirelessly trying to find that bike so that he could climb his way to the top, but he was constantly pushed right back down by the individuals around him and the social politics they shared. It’s a film everyone should see at least once.